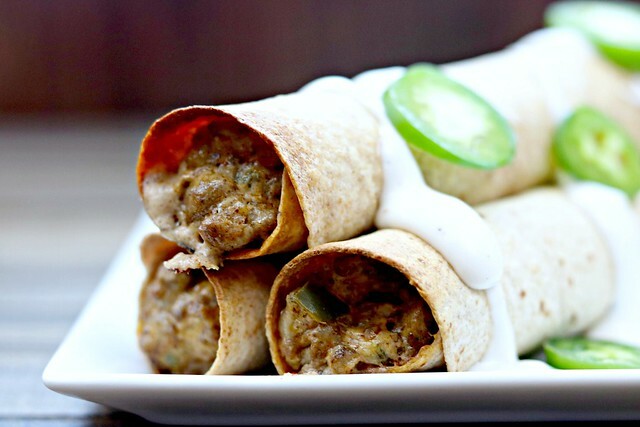 All the flavors you love in a jalapeno popper, mixed with ground beef, and wrapped up in a tortilla! Can you believe it’s already the last week of March? Spring break is over for most and Easter is fast-approaching. Then, before we know it, summer will officially be here. I mean, at near-90 degrees, it’s pretty much already here in Texas, but “officially”, we still have a few months. Which, is a little scary considering how warm it already is. J and I are currently working on some house renovations, including our back deck area. When we moved in it had one of those fancy schmancy pergolas, which J has hated from day one. So, we had a solid roof put on, some new railing and stairs, and once we finish painting and staining, we’ll be getting a new grill and patio furniture. Like, real patio furniture that won’t get destroyed by rain and wind. Yay!! Oh, and the new grill…ours was destroyed in a recent storm that blew the grill off the deck (yes, OFF the deck), as well as lots of shingles off our roof (new tin roof, coming soon!) so we will be purchasing a new one (we decided on this one) so that summer grilling can commence! And you know one thing that I love to make on the grill? Jalapeno poppers. You know the ones…stuffed with cream cheese, wrapped in bacon. The occasional protein (beef, dove, chicken) mixed in. They are grilling perfection, and my mouth waters just thinking about them. We need to hurry up and get the deck finished! But in the mean time, I can still enjoy the flavors of my beloved poppers without the grill. 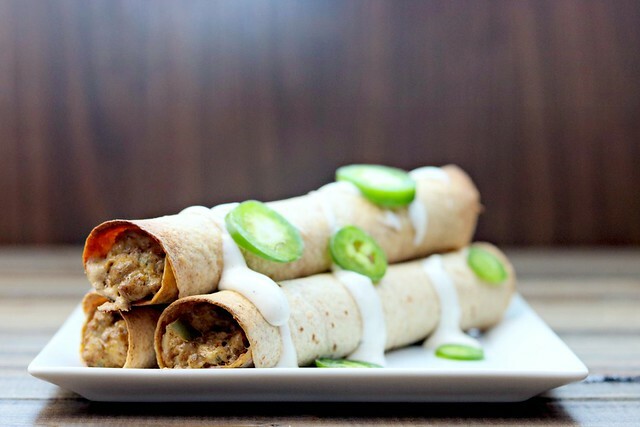 These beef jalapeno popper taquitos combine ground beef, cream cheese, jalapenos, and shredded cheese wrapped up in a crisp tortilla and served with ranch dressing. If you can’t grill, you don’t have to miss out on the jalapeno popper taste! What a great way to kick off spring/summer Taco Tuesdays! Preheat oven to 350 degrees, line a large baking sheet with foil, spray with cooking spray and set aside. Heat a large skillet, add beef and jalapeno and cook until jalapenos are softened and meat is cooked through. Add garlic and sauté for 30 seconds. Drain off any excess fat and liquid, if there is any. Stir in all of the spices, followed by the cream cheese. Reduce heat to medium-low and stir until cream cheese is completely melted. Stir in 1 cup pepper Jack cheese until melted and remove from heat. To assemble, add a few tablespoons of filling to the bottom third of each tortilla, sprinkle with a tablespoon or so of cheese, and roll up tightly. Place, seam side down on the prepared baking sheet and repeat until all the filling and/or tortillas are used up. Bake for 10-15 minutes, or until tortillas are browned and crisp and cheese is nice and bubbly. Serve with ranch dressing!